The Force Awakens To Have Flashbacks! Luke has been missing from a lot of the promotional images and the full length trailer, which has caused a lot of questions and theories, Where is Luke and could he be the Sith lord we’re looking for? Fortunately, Luke is not going to be the villain that everyone suggests, despite what Mark Hamill may have suggested to Abrams years ago. In fact, Luke has not been entirely missing from the promos. We do see what looks like Luke placing his hand on R2, as if saying goodbye as well as Luke narrating discussing about the lineage of his family and their connection to the force. He sounds like the old Luke from the originals, not some mysterious sith lord. Along with that, Luke fully accepted his role as the last Jedi after seeing what the dark side had done to his father. He was willing to die a Jedi than to be twisted by the dark side. 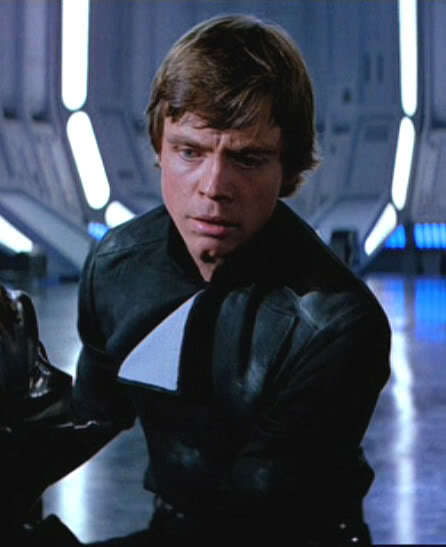 Many forget about the symbolism of Luke’s uniform from Return of the Jedi. In the photo above, Luke is wearing black. During his battle against Darth Vader, he allowed his emotions to pull him close, if not briefly, to the dark side in order to protect his sister. During this battle, we see that part of his tunic falls apart to reveal white underneath, symbolizing the Jedi inside. Hence the perfect title, Return of the Jedi. Now for some possible spoilers, so stop reading if you are trying to hide away from knowing anything about the movie til it’s theatrical release. I hardly take any of these seriously considering that there are so many that claim they have the inside scoop of what is going on in the movies. But this one sounds a little along the lines of what I was thinking. A lot of people were wondering why Luke was not in the trailers. Could it be a reveal in itself that Luke is no where to be seen? Would it suggest that he is indeed hiding and waiting for the right moment to show up? Much like the Emperor did before he took down the entire Jedi Order? According to Star Wars Underworld. the scene we see of Luke placing his hand upon R2’s dome is a flashback scene. We’ll place some of our thoughts in parenthesis of why we think this makes sense. Not only do we see a possible reason of why Luke is in hiding, we also get a little backstory to Rey. A lot of people suggested that she was a Skywalker, or a Solo. Whether any of this is true or not, it sounds a lot better than Luke being the dark master of Kylo Ren or the idea of the Clone Wars coming back in the form of an army of CGI Anakins and Vaders. While there are rumors of Hayden Christiansen to return in one of the films, it could just be a holocron recording. Previous Previous post: The Trailer Is Here! Next Next post: New Duracell Advert!